A tarp is basically a sheet of waterproof fabric which can be attached with guylines to trees, trekking poles, rocks and other stabile things to form a shelter. Tarps are by far the lightest portable shelters; a high-quality tarp which accommodates two persons can weigh as little as 10 ounces (300 grams). Different modular components are available for tarp shelters such as inner bug nets, groundsheets, bivy sacks and hammocks. A bug net, for example, comes in handy in warm weather to prevent the mosquitoes from entering the shelter while a bivy sack will protect you against horizontally blowing precipitation. You might think that it is much simpler to just bring a tent but using a tarp with modular components allows you to pack according to the expected conditions on the trail. Therefore, you can reduce the weight of your backpack significantly by leaving unnecessary things at home. Tarps are also inexpensive and very versatile. However, some skills are required to properly pitch the tarp, which is why tarps are not recommended for those who are new to camping out in the wild. How to set up and secure the tarp depends on the terrain, but in general woods are the best place to set up a tarp shelter because trees can be used to suspend and secure it. A tarp should also be pitched according to the weather; for example, in stormy conditions a tarp should be pitched closer to the ground for better protection against rain and wind while in warm weather it can be pitched higher for better ventilation. To efficiently use a tarp as a shelter you should also know some basic knots. In this review we selected and reviewed the best backpacking tarps. We only listed lightweight backpacking tarps that provide great durability and protection against the elements. If you are undecided whether to get a backpacking tarp, bivy sack or a backpacking tent, also check out our reviews of the Best Bivy Sacks and Best Backpacking Tents. As for the comfort inside the portable shelter of your choice, we have also made reviews of the Best Sleeping Pads and Best Sleeping Bags. 1. 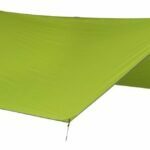 Buying a Backpacking Tarp – What is important? Backpackers use tarps instead of tents to pack their backpacks lighter. Therefore, a backpacking tarp should be significantly lighter than a tent. High-quality backpacking tarps that can accommodate two persons weigh as little as 10 ounces while high-quality two-person backpacking tents weigh in average around 3 pounds as seen in our list of the best backpacking tents. Read more about why it is important to use lightweight gear for backpacking in our article Why hike lightweight. Backpacking tarps in general take up very little space in a backpack – less than bivy sacks or tents. In this selection we only listed backpacking tarps that pack very small. The bigger the tarp, the larger area it will cover and shield from rain and wind. You can also increase the covered area by decreasing the internal height (A pitch). 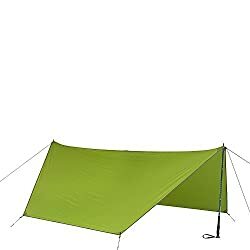 However, if you decrease the internal height too much you will have problems using modular components such as an inner bug net or a bivy sack. Backpacking tarps are usually made of nylon – the same material as the canopies of tents are made of. The nylon fabric is typically impregnated with silicone or coated with polyurethane to provide good protection against the elements. Many manufacturers also use ripstop technology (e.g. the fabric is reinforced with interwoven threads) to increase the abrasion resistance. The fabric of a tarp is not breathable, but you seldom have condensation issues with a tarp shelter as the very setup is well-ventilated. However, you should make sure that no part of your sleeping bag is in direct contact with the tarp as the heat from the sleeping bag can cause condensation to form on the tarp, thus making the sleeping bag moist/wet. Backpacking tarps have six attachment points or more, depending on the tarp’s size and design. There is usually one attachment point close to the each of the four corners while two additional attachment points are located on the sides in the middle. The attachment points in the middle allow you to suspend the tarp. These two attachment points can usually hold the tip of a trekking pole or a stick, so that you can easily suspend the tarp even if there are no trees around. Another four attachment points (stake loops) are used to fasten the tarp to the ground with stakes. Weight 11 oz. (M) 16 oz. (L) 13 oz. 11 oz. 1 lb. 6 oz. 16 oz. Size (Length/ Width) 102 x 102 in. (M); 120 x 120 in. (L) 114 x 102 in. 86 x 39/31 in. (inner dimensions) 78 x 68 in. (inner dimensions) 126 x 76 in. Packed Size 7.5 x 3.0 in. (M); 9.1 x 3.0 in. (L) 9.1 x 3.9 in. 7.9 x 3.1 in. 7.9 x 4.3 in. 8.7 x 4.7 in. 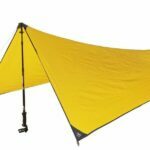 The Sea to Summit Escapist backpacking tarp is due to its low weight very popular among backpackers. It is the smallest (packed size) and lightest (per m2) product in this review. The tarp is made of 15-denier polyurethane-coated and silicone-impregnated nylon. Therefore, it provides good protection against wind and rain. The material is rather thin but as it features reinforced corners (210D nylon) it provides good durability. The Sea to Summit tarp has eight attachment points (with cord adjusters); the two in the middle can also hold the tip of a trekking pole. Due to the many attachment points, you have multiple options when it comes to pitching the tarp. The Sea to Summit Escapist tarp is available in two different sizes; M which measures 260 x 260 cm and L which measures 305 x 305 cm. Both sizes are designed to accommodate two persons but the largest one offers more space for the gear. Sea to Summit also offers modular components for this tarp, such as the Escapist Groundsheet, Inner Bug Tent and Bug Net. 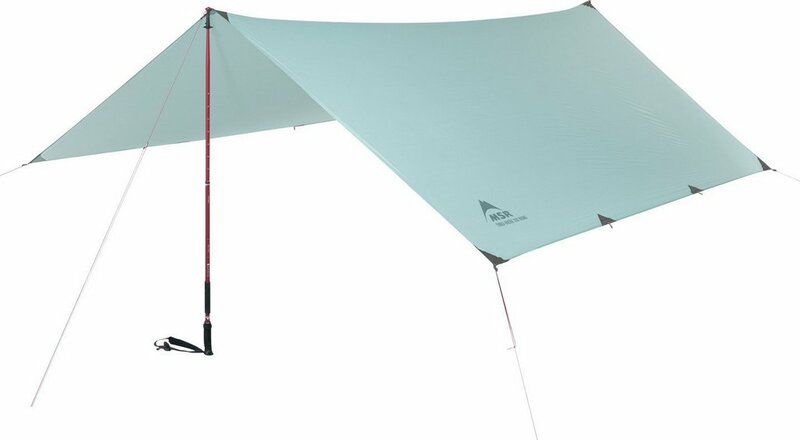 All modular components work best with the Escapist tarp in size L.
The MSR Thru Hiker 70 Wing is another very popular backpacking tarp. 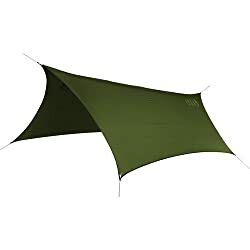 In comparison to the Sea to Summit tarp it is slightly heavier per m2 but on the other hand it is also made of a sturdier and more durable material (20-denier polyurethane-coated and silicone-impregnated ripstop nylon). The MSR tarp has six attachment points which are compatible with trekking poles for easy set up. The MSR Thru Hiker 70 Wing tarp measures 290 x 260 cm and is thus sized somewhere in-between size M and L of the Sea to Summit Escapist tarp. MSR states that the tarp is suitable for two to three persons. However, with three adult persons in the shelter, the gear will most likely have to be left outside. 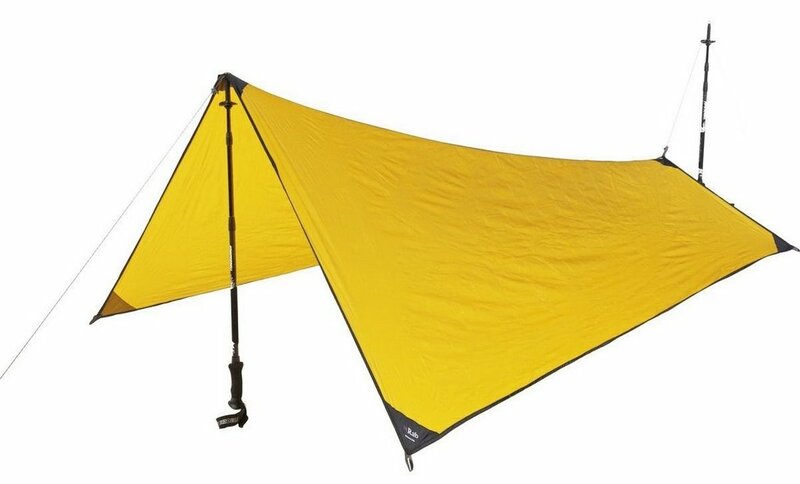 The MSR tarp is compatible with the MSR Thru-Hiker Mesh House 2 and Mesh House 3. The Rab Element Solo is an extremely minimalistic and light tarp shelter (it weighs merely 10 ounces). Unlike the Sea to Summit Escapist and the MSR Thru Hiker 70 Wing, the Rab Element Solo can only accommodate one person. 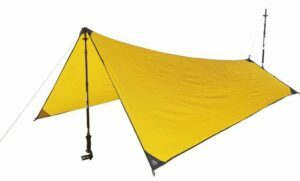 The tarp also doesn’t have the conventional rectangle/square shape which makes its internal height lower in one end when it is pitched. This design, however, increases protection against rain and wind. The Rab Element Solo tarp is made of a very durable silicone-coated Cordura fabric. It also features two attachment points with guylines and four stake loops. 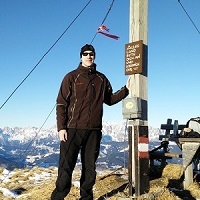 The attachment points can also hold trekking poles. The Rab tarp is compatible with the Rab Element Solo Bug Tent which has a floor made of 40-denier nylon and upper part made of breathable mesh fabric. 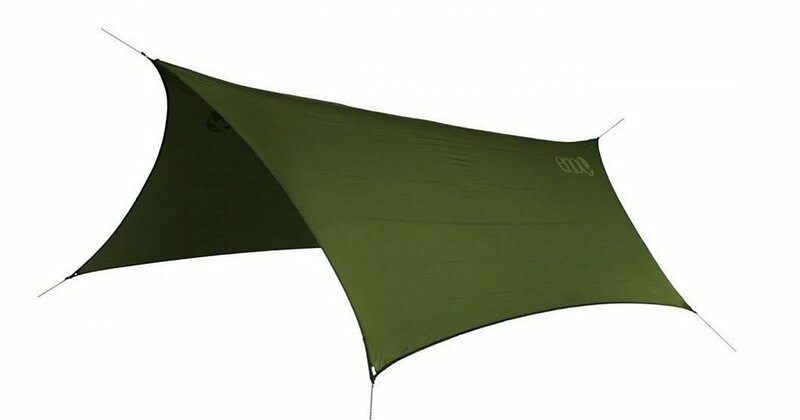 The Kelty Upslope is a budget backpacking tarp which offers a lot for the price. The tarp is made of durable 40-denier silicone-impregnated nylon which provides great protection against the elements. However, because the fabric is very robust, the Kelty Upslope is also heavier than the tarps listed above – it weighs no less than 1 pound and 5 ounces. 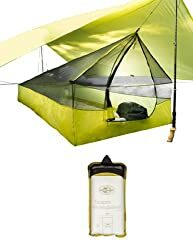 The tarp can be secured with four stakes (adjustable stake loops) and suspended with 3 guylines and two trekking poles. The Kelty Upslope has guyline storage pockets for easier handling and faster set up. The tarp can also be used as a vestibule for the Kelty’s TN2 TraiLogic Tent. 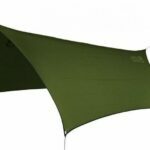 The Eagles Nest Outfitters ProFly Sil is a budget backpacking tarp. This tarp is primarily intended for the ENO hammock, but you can also use it as a substitute for a tent. That is, as long as you have trees around your camping place as the Eagles Nest tarp cannot be suspended with trekking poles. 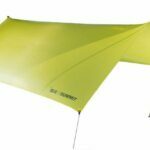 The tarp is made of polyurethane coated 15-denier ripstop nylon and thus offers great weather protection. 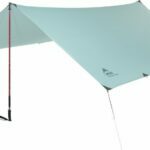 The Eagles Nest Outfitters ProFly tarp is equipped with six attachment points which allow you to easily secure the tarp. What is the best tarp material? The best material for tarps is nylon because it is lightweight, very sturdy and abrasion-resistant. However, as nylon is not waterproof it must be impregnated with silicone or coated with polyurethane. Nylon fabrics differ in denier value – the higher is the denier value, the sturdier and heavier is the fabric. No, all tarps are not waterproof. Waterproof tarps are made of nylon that is impregnated with silicone or coated with polyurethane.